Jung Byung-gil’s Confession of Murder may have been a slightly ridiculous revenge drama, but it had at its heart the necessity of dealing with the traumatic past head on in order to bring an end to a cycle of pain and destruction. Yu Irie retools Jung’s tale of a haunted policeman for a wider examination of the legacy of internalised impotence in the face of unavoidable mass violence – in this case the traumatic year of 1995 marked not only by the devastating Kobe earthquake but also by Japan’s only exposure to an act of large scale terrorism. Persistent feelings of powerlessness and nihilistic despair conspire to push fragile minds towards violence as a misguided kind of revenge against their own sense of insignificance but when a killer, safe in the knowledge that they are immune from prosecution after surviving the statute of limitations for their crimes, attempts to profit from their unusual status, what should a society do? 22 years ago, in early 1995, a spate of mysterious stranglings rocked an already anxious Tokyo. In 2010, Japan removed the statute of limitations on capital crimes such as serial killings, mass killings, child killings, and acts of terror, which had previously stood at 15 years, leaving the perpetrator free of the threat of prosecution by only a matter of seconds. Then, all of a sudden, a book is published claiming to be written by the murderer himself as piece of confessional literature. Sonezaki (Tatsuya Fujiwara), revealing himself as the book’s author at a high profile media event, becomes a pop-culture phenomenon while the victims’ surviving families, and the detective who was in charge of the original case, Makimura (Hideaki Ito), incur only more suffering. Unlike Jung’s version, Irie avoids action for tense cerebral drama though he maintains the outrageous nature of the original and even adds an additional layer of intrigue to the already loaded narrative. Whereas police in Korean films are universally corrupt, violent, or bumbling, Japanese cops are usually heroes even if occasionally frustrated by the bureaucracy of their organisation or by prevalent social taboos. Makimura falls into hero cop territory as he becomes a defender of the wronged whilst sticking steadfastly to the letter of the law in insisting that the killer be caught and brought to justice by the proper means rather than sinking to his level with a dose of mob justice. Justice is, however, hard to come by now that, legally speaking, the killer’s crimes are an irrelevance. Sonezaki can literally go on TV and confess and nothing can be done. The media, however, have other ideas. The Japanese press has often been criticised for its toothlessness and tendency towards self-censorship, but maverick newscaster and former war correspondent Sendo (Toru Nakamura) is determined to make trial by media a more positive move than it sounds. He invites Sonezaki on live TV to discuss his book, claiming that it’s the opportunity to get to the truth rather than the viewing figures which has spurred his decision, but many of his colleagues remain skeptical of allowing a self-confessed murderer to peddle his macabre memoirs on what they would like to believe is a respectable news outlet. The killer forces the loved ones of his victims to watch while he goes about his bloody business, making them feel as powerless as he once did while he remains ascendent and all powerful. It is these feelings of powerlessness and ever present unseen threats born of extensive personal or national traumas which are responsible for producing such heinous crimes and by turns leave behind them only more dark and destructive emotions in the desire for violence returned as revenge. Focussing in more tightly on the despair and survivors guilt which plagues those left behind, Irie opts for a different kind of darkness to his Korean counterpart but refuses to venture so far into it, avowing that the law deserves respect and will ultimately serve the justice all so desperately need. Irie’s artier approach, shifting to grainier 16:9 for the ‘90s sequences, mixing in soundscapes of confusing distortion and TV news stock footage, often works against the outrageous quality of the convoluted narrative and its increasingly over the top revelations, but nevertheless he manages to add something to the Korean original in his instance on violence as sickness spread by fear which can only be cured through the calm and dispassionate application of the law. Hideo Nakata is best remembered as one of the driving forces of the J-Horror boom of the late ’90s thanks to his hugely influential Ring movies. However, despite a few notable hits including Dark Water, his career has seen something of a slump following a foray into American filmmaking with The Ring 2 – a sequel to the remake of his own Ring (though entirely different from his Japanese language Ring 2 completed in 1999). Monsterz sees him helming a remake of another foreign property – this time the Korean sci-fi thriller Haunters. The film begins from the POV of Monster no. 1 (played by Tatsuya Fujiwara), who narrates much of the story and refers to himself solely as “monster”. Blindfolded, a small boy is dragged home by his mother only to be discovered by his abusive father who beats him and berates his mother whilst insisting “the monster” needs to die. At this point the blindfold comes off and the boy controls his fathers actions eventually persuading him to snap his own neck. Beginning to also control his mother, the boy stops short of giving her the same treatment and wanders off into the rain. Fast forward 20 years and the monster is now a criminal mastermind who uses his time freezing and mind control capabilities to make a living as a bank robber. However, one day he discovers someone who seems to be immune to his powers (Takayuki Yamada) and his whole world is shaken. The monster sets about removing this threat to his supremacy but it appears his opponent is also “a monster” – a man with super healing properties who cannot die! It takes a “monster” to fight a monster but which one will come out on top? Yes, lots of predictably comic book style action adventures begin as the two guys with opposing super powers face off against each other. The most interesting aspect of the film is that it’s mainly told from the point of view of the otherwise unnamed “monster” though Nakata’s attempts to make him a sympathetic anti-hero never quite work out despite Fujiwara’s committed performance. The film’s ending is also unconventionally unresolved (though also very true to its American comic book roots) with a pleasing note of tolerance and inclusivity thrown in. However, that is in part facilitated by the lack of tension in the central dynamic – the two opposing forces are at a perpetual stalemate which only ends up feeling, well, stale – in a word. The monster’s freezing and mind control powers are impressive but the action sequences are much of a muchness and just get bigger rather than more interesting. Having said that the action sequences aren’t unexciting, there are some impressive moments (bar the odd use of dodgy CGI and green screen). The main problem with the film is a slight mismatch in tones between Nakata’s portentous doom laden fatalism and the playful lightness of its comic book inspiration. The conventional hero, Shuichi, takes second lead here with his gang of sidekicks – otaku Akira and flaming queen Jun offering odd moments of comic relief. Though actually the role of Jun is another interesting inclusion as, despite offering a stereotypically “gay” character camping things up spectacularly, Jun is also presented fairly normally as a valued friend and comrade of the hero. His sexuality is merely a character trait, never a joke in itself which is a refreshing element particularly in a Japanese film. In the end, Monsterz aims to offer a message of tolerance and inclusiveness – that, oddly, there are no monsters and would be no villains if we could all just learn to accept each other’s differences and live together in harmony. However, the message is a little hamfisted and clumsily delivered and, some might feel, out of place in an action orientated film such as this. Very typical of the comic book movie genre (though perhaps more Fantastic 4 than Dark Knight), Monsterz is middling mainstream fare which, while mildly diverting, fails to offer anything particularly memorable. 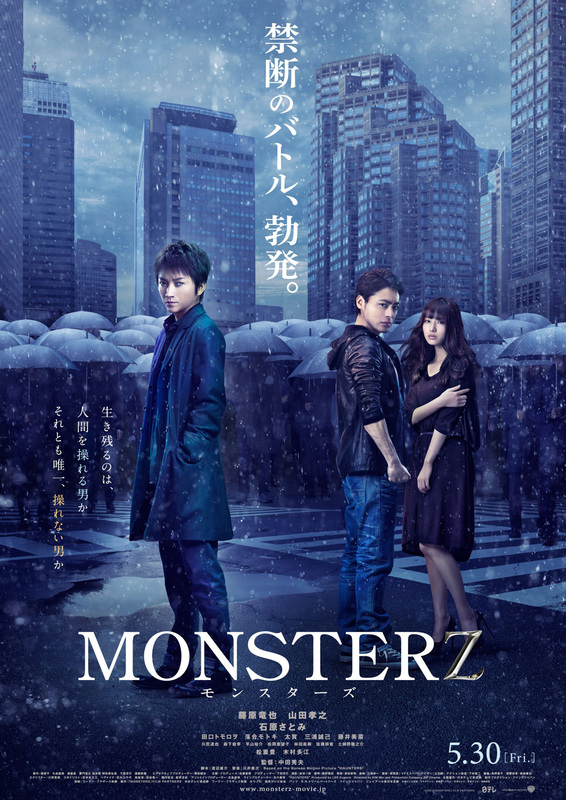 A fine way to spend 90 minutes, Monsterz never outstays its welcome and offers generally high production values plus Nakata’s trademark visual flair but is unlikely to satisfy more genre savvy fans. Review of the first Rurouni Kenshin sequel, Rurouni Kenshin 2: Kyoto Inferno up at UK Anime Network. At the end of the first Rurouni Kenshin live action film, you might have been forgiven for thinking that this once wandering warrior had finally found a place to hang up his (reverse blade) sword for good. As fans of Nobuhiro Watsuki’s much loved manga and its anime adaptation will know, there’s no such luck for Himura Kenshin or the long suffering Kaoru as once again Kenshin will be called upon to put his unique skills to use and this time the very survival of Japan’s new era of modernism and equality is at stake! Having successfully seen off would be drug baron Kanryuu and the false Battosai Jin-e, once remorseless killer Kenshin (Takeru Satoh) has moved into the dojo run by Kaoru (Emi Takei) and made a seemingly joyful life alongside Kaoru’s only pupil, the boy Yahiko (Kaito Oyagi), the doctor Megumi (Yu Aoi) and loud mouth Sanosuke (Munekata Aoki). However, the happy family’s peace is about to be rudely interrupted as an envoy from the Home Minister arrives and requests a private meeting with Kenshin. It seems an old enemy once believed dead has been discovered to be alive and currently plotting terrible vengeance against the new government in Kyoto. Shishio’s skills are matched only by Kenshin and so the government wishes to make use of his services once again to stop this new threat to the development of the modernising Japan. However, Kenshin has laid down his sword and dedicated his life to atoning for the lives he took as a warrior – will he really return to the life of a wandering swordsman? Originally reluctant and very much against the wishes of Kaoru, a tragic event finally convinces Kenshin he has no choice but to stop Shishio whatever the cost! Even more so that the first film, Rurouni Kenshin 2: Kyoto Inferno is set against the backdrop of a Japan in the middle of earth shattering cultural shifts. The age of the Shogun is over, there are no more samurai or feudal loyalties to fulfil. This fresh new world of possibilities has no place left in it for the men who fought so bravely to bring it into being. Some, like Kenshin, hung up their swords and set themselves into atoning for the violence of the past by vowing to build a better, kinder, future. Others, however, like Shishio, were left with nothing other than the desire to return to a world where their skills mattered – the familiar world of lords and castles and glorious battles. Kenshin and Shishio are two sides of the same coin – light and shadow. Having been assassinated and thrown on a funeral pyre before miraculously surviving thanks to a fortuitous fall of snow, Shishio has made fire his very own symbol and primary weapon of attack. This new world is a hell for him and along with his bandage clad gang of followers, he’s about to plunge all of Japan into a fiery abyss too. The first instalment was also notable for its fairly high production values and if anything, Kyoto Inferno even improves upon the original film’s impressive aesthetics. Fire in particular has often proved something of a bug bear for the modern action film and as you might expect from the title Kyoto Inferno is jam packed with flaming action. From its extremely striking opening scene, Kyoto Inferno lays on some of the most complex and beautifully filmed action sequences to be seen in a Japanese film in quite some time. Where it falls down slightly is bound up with its nature as the first part of a two part film as it is does begin to pile on the sub plots and risks becoming overloaded while the original gang (and particularly Yu Aoi’s doctor Megumi) end up with relatively little to do. Likewise, as with the first film the more manga-like elements such as some of the overly broad comedy or a couple of characters who are just the wrong sort of outrageous don’t quite fit with the otherwise classical feeling of the film though fans of the manga franchise may appreciate this attempt at remaining faithful to the source material. In many ways the Rurouni Kenshin movies are just fluffy mainstream action films (not that there’s anything wrong with that) but Rurouni Kenshin 2: Kyoto Inferno is that rarest of beasts in that it manages to build on the foundations of the first film to become something greater with the result that it even helps to elevate the original. Of course, this largely hinges on how well the last part of the trilogy, appropriately entitled The Legend Ends will fare but suffice to say the first two thirds have stood it in very good stead. Action packed but with a tightly plotted storyline, convincing characters, good performances and high production values Rurouni Kenshin 2: Kyoto Inferno offers everything that’s good about blockbusters without any of the drawbacks. In fact the only real problem that the film presents is the likely long wait until The Lengend Ends finally arrives! Well worth seeing on the big screen, might even be better than the first one!